Charlie Frye is hard to miss. A tall, burly fellow with a full beard and ponytail, he walks the streets of downtown Lenoir with his purple owl coffee mug in hand, wearing acrylic-stained duck bib overalls. Cars honk and passengers wave as they drive by. Frye, who is a self-trained folk artist and knows most everyone in town, cheerily calls out each driver’s name, spilling some of his coffee as he waves back. 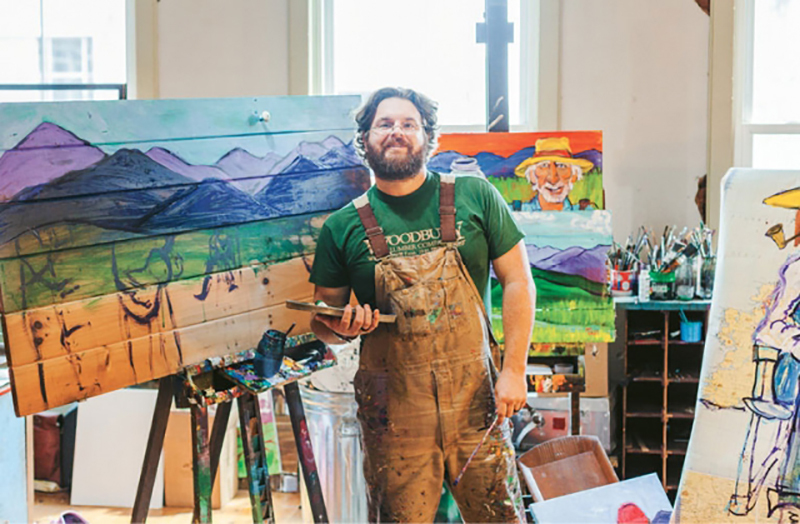 The city itself is lined with Frye’s artwork; restaurants, cafés, and law offices all hang his bright, multi-layered acrylic paintings, black and white woodblock prints and ink drawings, or quirky found-object sculptures. His very truck, a ’78 Ford F-150 named Minnie Pearl, doubles as a canvas, as well. On its tailgate, an owl painted orange, brown, and red looks out onto Lenoir’s traffic. Frye’s use of acrylic, his primary medium, further plays into his work’s honesty. Part of the paint’s appeal is that it dries faster than other mediums. In this way there is a degree of urgency in Frye’s creations, which aids in the overall spontaneity of any given piece. For Frye, this element is crucial in capturing the emotion behind a painting. Despite the fact that Frye didn’t take up art until he was 25, his work has caught the attention of galleries throughout the South. He’s represented at noted southeastern folk art galleries, including 87 Ruffin Street in Linville, and participates in exhibits and folk art shows.